You know how it is with those of us who never did this stuff for a living - we have knowledge and experience, but only of the limited range of things we've actually done. So as soon as we get to something basic, but previously not done, we have to ask embarrassingly basic questions. At least that's MY excuse, and I'm sticking to it! I'm making one because (for reasons too tedious to detail) I want to make a steel one rather than the stock dural one. The fits need to be quite good to preserve balance because the fan unit does around 140,000rpm (for example there are two grub screws simply because the vibration when only one is fitted is enough to wreck the motor bearings), but it's still a very simple thing to make. So I made one and I reamed the 4mm hole. It's a superb fit on the shaft BUT it's a blind hole - a 6mm hole in a shaft that has an M6 thread has to stop well short of the thread for obvious reasons. I realise now that reaming a blind hole is something I've never done before - the reamer appears to have a taper over the first 6mm or so, because the shaft jams before the end of the hole. I've looked around and a I can't see anyone offering "bottoming reamers" so am I looking in the wrong place or is there some other technique for doing close-fitting blind holes? I know it's a stupid question, but what am I doing wrong? You might even find it better to use 3 grub screws at 120* so that it is easier to centre the shaft. You could drill the full length of the shaft maybe 2 mm to get rid of some weight. The simplest solution would be to bore it to size. Otherwise a a custom D bit would do the job. I would make the bore first, and then turn a 4mm mandrel and mount it on and turn the OD. A hand reamer has a long taper lead in to align the reamer with the hole. A machine (chucking) reamer has almost no taper lead in, as it relies on the lathe to achieve the alignment. Peter you need to effectively bore the hole... (cheap ) purchased boring bits don't go that size but D-bits do. So you need to make yourself a D-bit or alternatively find a smaller milling cutter and use that as the edge to bore the hole. I can't see myself accurately boring a 4mm hole 20mm deep in steel with a boring bar - the tool would surely be nowhere near stiff enough? Would a D-bit be more accurate than just using a drill? I'll have a look at chucking reamers - perhaps using the hand reamer first and then the chucking reamer to finish the bottom of the hole. I should have mentioned that the other end of the part is bored and tapped M3 to take a screw that retains the spinner cone, so I'm not that concerned about the weight. A 4mm end mill would be better than a drill. You could always try reaming the hole with a 4.0 mm end mill in the tail stock and see if the fit is good enough for your needs. Which fans are running 140kRPM these days? Seems you have a few ideas to try. I'd just buy one, preferably collet type. The problem is when I want to remove the fan. If I want to remove a prop from a model motor (IC or electric) I hold the prop with one hand and the spanner with the other. But I can't do that here because the fan blades themselves aren't stiff enough and get damaged if you try. Some of the fans have adaptors which include a screwdriver slot across the front or a cross-hole for a tommy bar, but these are larger units (like the one in the above photo) and the adaptors are more substantial. I've tried both approaches with the standard adaptors for this unit and the material isn't strong enough - the slot soon "spreads" and the tommy bar hole just breaks out. So I thought I'd try making one from steel to see if it could take a tommy-bar hole without leaving the shaft too weak. Hence the questions! My only other thought was to cut a screwdriver slot at the front of the shaft (as I've done before) but make a tubular retaining nut with a collar that extended up the full length of the thread to support the slotted bit and stop it spreading/cracking. There is room inside the spinner dome to do this, but I don't happen to have any dural or bronze hex bar stock to hand to try it. I'm familiar with all this, though I haven't kept up with EDF for quite a while now. 140kRPM sounds unrealistic, maybe 70k? 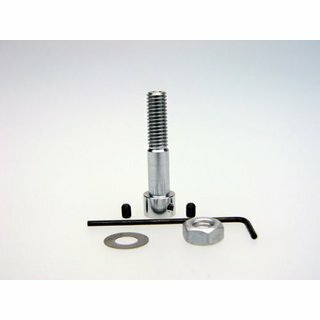 The torque on the running fan isn't tremendous, why are the adapters being tightened with so much torque? Which fan unit exactly is this? Specifics help understand the underlying cause. If it's a common problem why hasn't the manufacturer remedied it? The actual application is using the Wemotoc minifan housing with a chinese alloy rotor and a 3500rpm/v motor on 12s to get the revs. This setup produces around 40kN of thrust at 25-30A, which allows four 3s2200 packs to be distributed around the airframe rather than a single brick right in the middle where the intake duct should be! The high nut torque to because the metal fan boss has minimal compressibility so it needs to be nipped up tightly to prevent the fan coming loose if the ESC stutters (which it sometimes does on trailing throttle because of the timings used to maximise the revs - on an EDF you're not really bothered about smooth low-throttle/idle running). 40kN of thrust - should make it into orbit!!! 8900 pounds.....perhaps that should be 40 N? Sacrifice a reamer and cut the taper part? Damn keyboard threw in the 'k' - I'll have to give it a serious talking to! I did wonder about that - could I cut it with a carborundum disk in a dremel? But, you need the taper part to start a hand reamer. 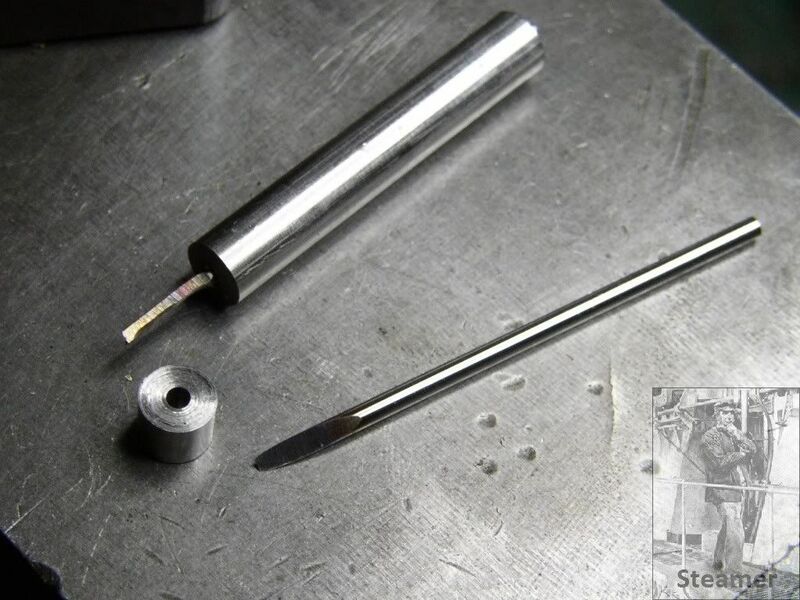 Try a 4mm end mill down the hand reamed hole to see if the final hole size is good enough. Bad Behavior has blocked 13035 access attempts in the last 7 days. Page created in 0.158 seconds with 19 queries.